There are few of our worthies who can look back upon a longer and more useful career, largely devoted to the spread of vegetarianism, than the Rev. Henry S. Clubb, President of the American Vegetarian Society, and editor of Field, Home and Garden, whose portrait appears above. Although Mr. Clubb has been so long identified with America, he is, by birth, an Englishman, having been born in 1827, at Colchester, Essex. He is a son of Mr. Stephen Clubb, who becam a vegetarian at the mature age of 72, and with great advantage to his health. Mr. H. S. Clubb became a vegetarian in 1840, having been converted by reading some vegetarian works. On the formation of the Vegetarian Society he became a member, and in the early days of the movement was local secretary for Colchester. 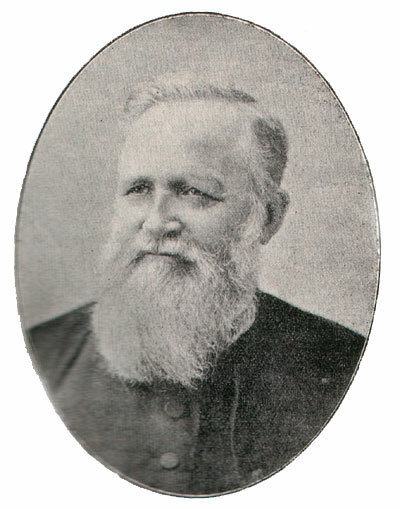 We soon afterwards find him in Manchester very busily engaged in spreading vegetarianism, and working actively in connection with the Bible Christian Church, of which he was admitted a member by Mr. Joseph Brotherton, M.P. The next few years of Mr. Clubb's life were largely devoted to vegetarian lecturing and he makes frequent appearance in the early volumes of the Vegetarian Messenger as advocating vegetarianism up and down the country. In 1849 he was elected president of a Dietetic Class in connection with the Library Institution, Salford. This class, of which Mr. Edwin Collier and Mr. Peter Foxcroft were active members, did good work in the education of its members in the principles of dietetic reform. He was also a contributor of excellent articles to the early volumes of the Vegetarian Messenger, of which we believe he was for a time the editor. This period in Mr. Clubb's life ended in 1853, when he emigrated to the United States and made what was probably his first appearance on the vegetarian platform in that country at the annual meeting of the American Vegetarian Society, on August 24th of that year. One of the first people of importance he met in America was Horace Greeley, with whom he worked for some time. He was a co-worker with Charles A. Dana on the Tribune and afterwards became a reporter on the Washington Union. During the session in which the famous debate on the admission of Kansas and Nebraska to Statehood was held was in the reporters gallery of the House of Representatives and he can tell many interesting reminiscences of the men and the time. Mr. Clubb was a radical abolitionist and wrote for the Tribune a series of articles on "Slavery as I found it," which attracted much attention and caused so much hatred for thier writer that it is said they nearly cost him his life at the hands of the Southern sympathisers of slavery. Though not, as a general thing, in favour of fighting. Mr. Clubb felt that the cause of right demanded his personal assistance. He therefore joined the Northern Army, and at the outbreak of the American Civil War he went to the front as a quartermaster, just after the disaster at Bull Run. His wife accompanied him on the campaign and was present at the siege of Vicksburg. On one occasion Mr. Clubb was struck in the side by a bullet and he still bears the scar from the wound. In an inside pocket of his coat, however, was a well-filled purse, and the force of the leaden missile was broken in passing through this, the government's money saving the life of at least one of its quartermasters. The bullet slashed Mr. Clubb's naturalization papers all to shreds.